Bolton Bees Are Healthy Bees. We do not migrate. Our bees stay in Minnesota the entire year. Our bees are not exposed to the stressors of being transported around the country; they do not lack nutritious forage; they are not knowingly being sprayed with pesticides. They are not exposed to an unacceptable level of pests and diseases. Bolton Bees have the genetic predilection to survive a Northern winter. Conversely, if backyard beekeepers purchase bees from a migratory beekeeper, they will likely be purchasing bees that have endured the stressors of the pollination industry. 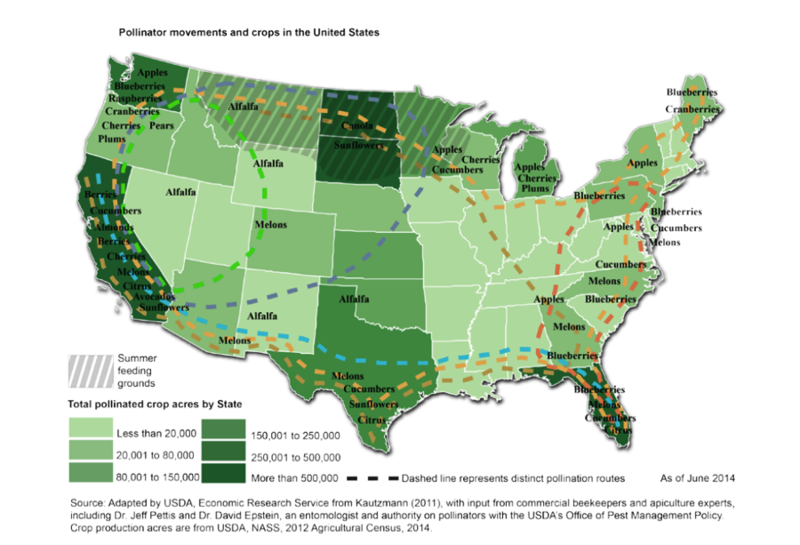 1.6 million[ii] honeybee colonies (more than 85% of commercial beekeeping hives[iii]) are trucked across the United States to California’s 800,000 acres, a 400-mile stretch, of almond orchards. This is not healthy for bees, because bees are highly dependent upon diverse floral resources. The benefits of having a variety of pollen available to a colony has been well researched—both quality and diversity of pollen is necessary in the development and survival of the honeybee. Monofloral crops provide inadequate nutrition and can endanger colonies by diminishing their immune response[iv],[v],[vi]. Additionally, the timing has to be perfect; if the bees arrive too soon or leave too late, the bees will starve because there will be no flowers in bloom- this is a feast or famine situation[vii]. Migratory beekeepers will artificially feed their colonies to prevent starvation. These bees also encounter another serious hazard: the massive amount of pesticides sprayed on the crops being pollinated. Many of the most dangerous agrochemicals, like adjuvants, are classified as “inert ingredients” and are mixed into the pesticides. Since these chemicals are considered inert, they are not required to be registered or included on the label[viii]. Once bees are exposed to these pesticides, they lose their ability to function-- their abilities to learn, forage, and return to their hive are greatly affected[ix]. Besides being weakened by poor nutrition and being exposed to pesticides, the 1.6 million colonies are susceptible to each other’s diseases and pests. When bees are already weakened, they cannot fight off the diseases and pests they may otherwise have been able to endure. These diseases and pests can be fatal to weak colonies. Many blame colony collapse disorder (a recent phenomenon of bees disappearing) on the lack of healthy bee nutrition, exposure to pesticides, and the spread of diseases and pests. The packages provided by migratory beekeepers are trucked from the Southern United States or California to the Midwest[i], regardless of weather conditions. In spring 2016, many backyard beekeepers received their packages during a snowstorm, and their bees did not survive. After receiving the package, customers shake the bees into their bee boxes and place the caged Queen into the hive. Package bees are developmentally behind because they do not include brood (future bees), depriving the hive of bees of various ages. Young bees are crucial to colony health. Even if the package bees survive, accept the Queen, and become established— they still must be able to withstand a Northern winter. 5. Alaux, C.; Ducloz, F.; Crauser, D.; Le Conte, Y. Diet effects on honeybee immune competence. Biol. Letters 2010; 10.1098/rsbl.2009.0986.